Also known as Tierra del Fuego, the Land of Fire lies at the southernmost tip of South America and is a teardrop-shaped archipelago jutting into the infamous waters of the Drake Passage. Evidently, the name of these islands does not refer to the weather. They were named by the Portuguese explorer Ferdinand Magellan, not for their typical temperatures but for the columns of smoke he saw rising from the fires of the Yahgan people who inhabited the land—an antidote, perhaps, to the eerie emptiness that defines this place. In Patagonia, however, it’s easy to get caught up in romantic and highly impractical ideas. 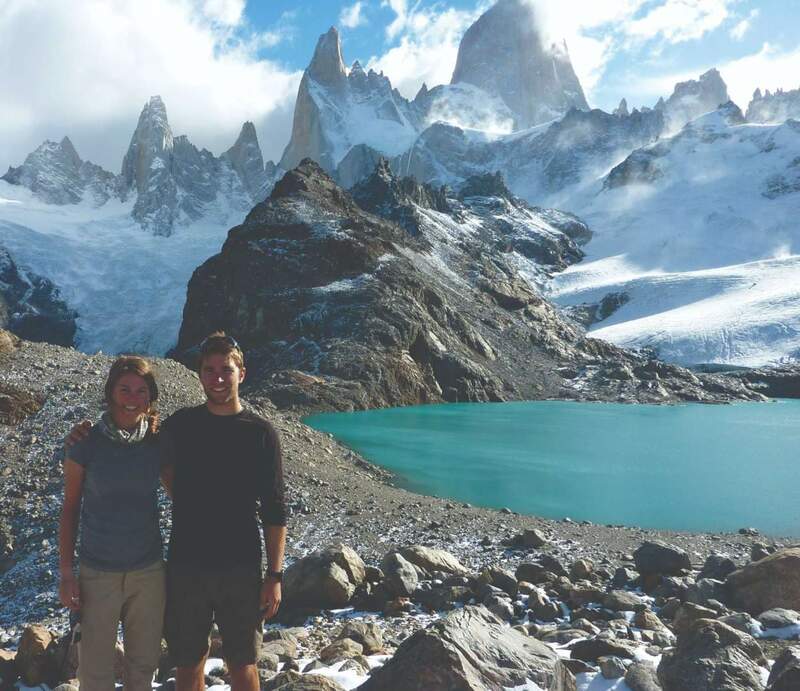 So, a 5000-kilometre bicycle trip down the spine of the Andes seemed like a reasonable thing for a couple of 22-year-old college grads to do. 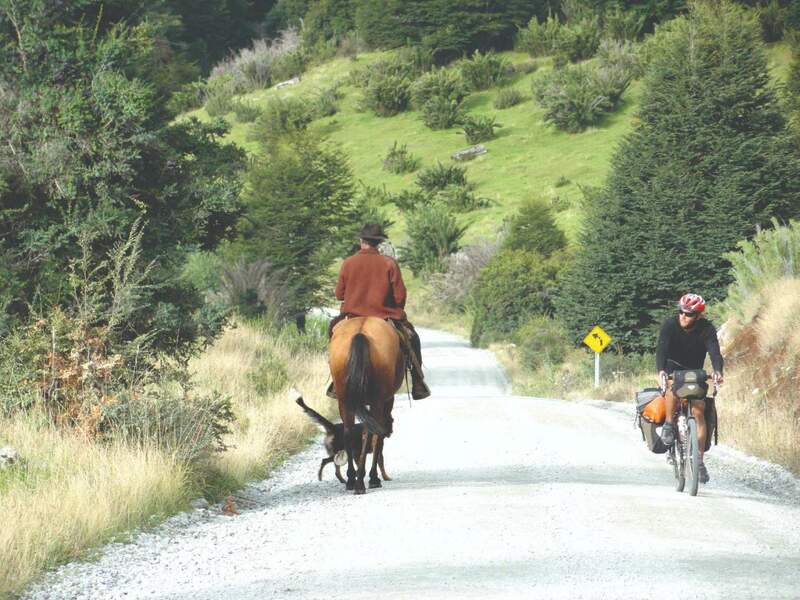 Our plan was to ride from Salta, in the northwest corner of Argentina to Ushuaia, billed as “the southernmost city in the world.” We planned on criss-crossing between Argentina and Chile, weaving our way down the spine of the longest mountain range on Earth. In truth, we were an unlikely choice for a trip of this sort. My biking partner Alex was an ex-football player who had not ridden a bike in years. I was the so-called expert. Although I had gone on a few bike tours in North America, unbeknownst to Alex, I could barely change a flat tire. We had a grand total of four days of riding together in the bucolic Berkshires of western Massachusetts, and our Spanish skills were substandard at best. Before we left for our trip, I had assured him that southern Patagonia in late April was just like autumn in New England. Alex claimed he had harboured reservations about my weather predictions and with snow now driving relentlessly into the side of our faces, he made some pointed remark about “trusting” my supposedly thorough research. “Just like I trusted that you could read maps and fix bicycles,” he said. Those carefully orchestrated pretenses dissolved quicker than I would have liked—on Day 1, to be precise. But to our equal amazement, after more than three months, Alex was still here. We were not the first to fall for Patagonia’s lethal beauty. The landscape stretching across the southern cone of South America is one where myth and truth have wound together. In the province of Chubut, on a lonely stretch of road outside Cholila, I touched the rough wood of Butch Cassidy’s cabin. A century ago, in that remote corner of the province, Butch and his gang of bandits made their escape, and according to some, met their end. Farther south, near Puerto Natales, famed writer Bruce Chatwin’s tales (from his renowned book, In Patagonia) haunt the edge of Last Hope Sound, where a cave holds the remains of a prehistoric mylodon (a giant ground sloth that lived more than 10,000 years ago) preserved in rock. In Patagonia, the landscape can seem as unreal as the stories that animate these vast spaces. Mountains sprawl into the sea, and the ocean finds its way inland through long fjords splintering the coastline. Green forests spill onto the blue white expanse of glaciers, and cords of frothing blue rivers churn through valleys of stony silence. As we approached what felt like the end of the Earth, the shortened days had us chasing our own shadows and the ghosts of forgotten legends. From our vantage point on the northwestern edge of Tierra del Fuego, the southern Patagonian ice cap is a smudge of glaciated peaks rising above the horizon across the Magellan Strait. The weather changes fast here and, suddenly, we are pedaling into a wall of wind and driving rain. We see a thin column of smoke rising in the distance. Two gringos on bicycles pedal down to several fishing shacks perched on the beach. They’re in various states of disrepair, made mostly of corrugated iron, some patches of tarpaulin and wood slats nailed haphazardly across the sides. A small dark-haired man emerges from one, his weather-beaten features and salt-encrusted hands holding a bucket of fish. “Es possible a campar aqui? Necessitamos proteccion contra la lluvia y el frio (Is it possible to camp here? Can we get some protection against the rain and the cold? ),” we ask in broken Spanish, hoping he won’t be put off by our self-inflicted helplessness. Three months earlier, the rain and cold were beyond imagination. We had left Salta, a town 40 km south of the Bolivian border, in the middle of summer. From here, we headed south into bone-dry heat that blistered the skin and red-earth canyons sculpted by wind. This was the Ruta Quaranta (or Ruta 40, as it’s also called), an infamous highway running the entire length of Argentina. Headwinds and long unpaved sections of road led through a barren vastness broken only by cacti and the occasional adobe shack selling empanadas and sometimes coca leaves. Bicycling through a desert, however, produces its own mind-altering reality and, arguably, a better high than the mild stimulant of coca sold at roadside stalls. Outside Los Cerrillos, the words salva su ama, or “save your soul,” were sprayed on a rock. But in this place, we felt already damned—by heat, by wind, by sky. So we drank cold beer and kept pedaling. During the evenings, we rolled our bikes off the road, into a desert painted gold. We pitched our tent on a patch of sand beneath night skies flickering with the Southern Cross—a constellation found only in the Southern Hemisphere. Here, we were sometimes lost, but never lonely. Physically we were in our prime. Or so we thought, until we met a retired couple from Switzerland dubbed “Hanz and Franz” by Alex. After trying to match their brutal pace for an hour, we gave up and pretended to stop to take some pictures. They waited for us down the road, unfortunately, and then proceeded to describe their extreme route over the Andes, taking a brutally high, unpaved 5000-metre pass called the Paso San Fransisco over the mountains and down into Chile. Three weeks later, we ran into Hanz again, this time alone. Apparently, their sleek touring bikes with their skinny wheels could not handle the rough roads on their intended route. And Franz (the wife) was tired. I’m ashamed to say we congratulated ourselves on choosing fat tires and a more leisurely pace. Yet Hanz was eager for our company, and with three weeks of biking under us, we were more than confident we could keep up with him. Alas, after a mere 30 minutes, we were crushed yet again by the skinny 65-year-old wearing Lycra. Even more demoralizing, a few hours later, we passed him at a roadside restaurant, smoking a cigarette and downing two pints of beer. He just smiled at us. “Maybe we camp together later tonight?” he asked. Bruised egos aside, we learned, rather quickly, that despite reading endless Internet blogs dedicated to bicycle touring, we were clueless about preparations for this type of trek. Even basic tasks, such as buying sufficient food and waking up at a decent hour to avoid riding in the heat of the day, proved difficult to master. Alex is not a morning person. I discovered this on Day 1, and after trying unsuccessfully to drag him out of the tent before sunrise, I gave up and we just rode through the hottest part of the day. Our food choices were no better. Wine was readily available and very cheap. Wine, however, is not ideal fuel when bicycling through a desert in oven-like temperatures. Neither was dulce de leche, a goopy caramel-like sauce made of condensed milk and sold everywhere in Argentina. But this was often our only option, thanks to our habit of rolling into town during the afternoon siesta, when every store was closed. It also required zero preparation, could be slurped directly out of the container (no utensils needed! ), and was addictively sweet. In short, it seemed the ideal biking food. But after one too many evenings spent trying to pedal in a hypoglycemic stupor, we vowed to look for other ways to fill our caloric needs. Ice cream and cheese became staples—until Alex remembered (after suffering through a few weeks of stomach cramps and, er…other issues) he was lactose intolerant. West of Mendoza, we climbed out of the heat into the Andes. But, in a few moments of ill-advised audacity, we opted out of the standard route and chose a rarely travelled dirt road that ascends a 3000-metre pass. After 365-degree turns, and four hours of arduous uphill pedaling, we still had not reached the top. When we finally crested the pass and saw Aconcagua looming in the distance, my eyes misted over slightly—not from the sight of snow and ice clinging to the highest mountain in the Western Hemisphere, but from the realization that we had to descend 1000 metres, then regain another 2000, before we could coast downhill into Chile. Alex was ahead of me and when I reached him I found him casually sitting on the side of the road eating peanuts, grinning. “But you used to be good at hills,” Alex said, trying to comfort me. On the western side of the Andes we veered south again, down the longest, skinniest country on the planet. Our route along the coast was a slightly incoherent configuration of back roads, sometimes corresponding to lines on the map, sometimes not. In any event, I think maps are of limited use for cyclists in these situations. They measure the distance between places, but not the effort required to pedal up obscenely steep hills coated in sandy gravel. On more than one occasion, I was reduced to pushing my bike uphill, cursing aloud at passing vehicles. I guess cars were invented for a reason. But there are some advantages to travelling on a bicycle. The ability to camp illegally under an active volcano, for instance. We snuck past the guard in Conguillo National Park because a sign at the entrance informed visitors that the risk of an eruption was low. To us that meant “safe.” Crawling under barbed wire to camp in a farmer’s field, however, was a different story. That particular incident set off one of our many arguments. Most were the result of our opposite personalities, another slight oversight in our preparations, perhaps. Alex was the pragmatist; I was the optimist and naive romantic. He fussed over little details that I brushed aside as minor, like the time I used my fingers to tighten the bolts on my bike rack, only to have the entire rack fall off just as I was speeding downhill. Rumours of biblical rains and political unrest followed us onto the Carretera Austral, a roughly 1,200-km unpaved highway through rural Chilean Patagonia. Back in the 1970s, Chile’s notorious dictator, Augusto Pinochet, had the idea to build a road connecting the settlements in Chile’s remote southern region with the rest of the country. For days, washboard gravel had us gripping our handlebars in teeth-chattering, bottom-numbing misery. Fortunately, the scenery helped somewhat. We rode through an impenetrable wilderness carved by glaciated mountains, turquoise lakes and voluminous rivers. 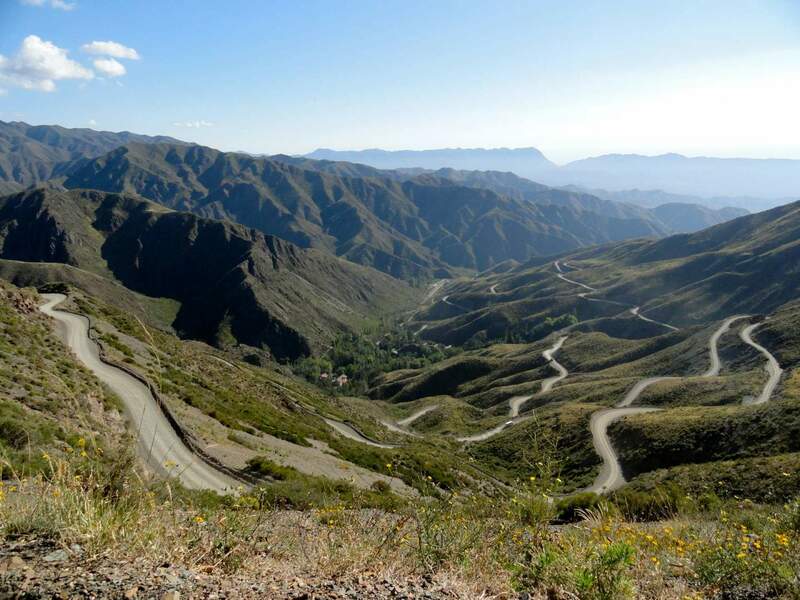 The last hundred km of the Carretera were completed only 12 years ago, an unsurprising fact given that many sections of the road were little more than a narrow track. We emerged briefly from the green mist-soaked mountains in Puyuhuapi, a little village at the end of a long arm of the sea. A few km of fishy-smelling ocean, and then we head uphill once again into a dense cloud forest locked in grey drizzle. It was almost dark but the hill had no end in sight. We just kept pedaling upwards, encased in a white bubble of fog, and before we are also swallowed up by darkness, we pitched our tent on the only clear spot we could find, just a few feet from the road. The Chacabuco Valley pulled us off the Carretera, and back toward the dry eastern slopes on the Argentinean side of the Andes. The turnoff was unmarked, but the map showed only one road leading to the border, so we took a guess and hoped it was a good one. Immediately, the Baker River’s turquoise ribbon gave way to a windswept valley of yellow shrubs and endless skies. This was Conservacion Patagonica, a newly-created national park spearheaded by Doug and Kristine Tompkins, American conservationists (and founder of The North Face and CEO of Patagonia, the outdoor apparel brands, respectively). 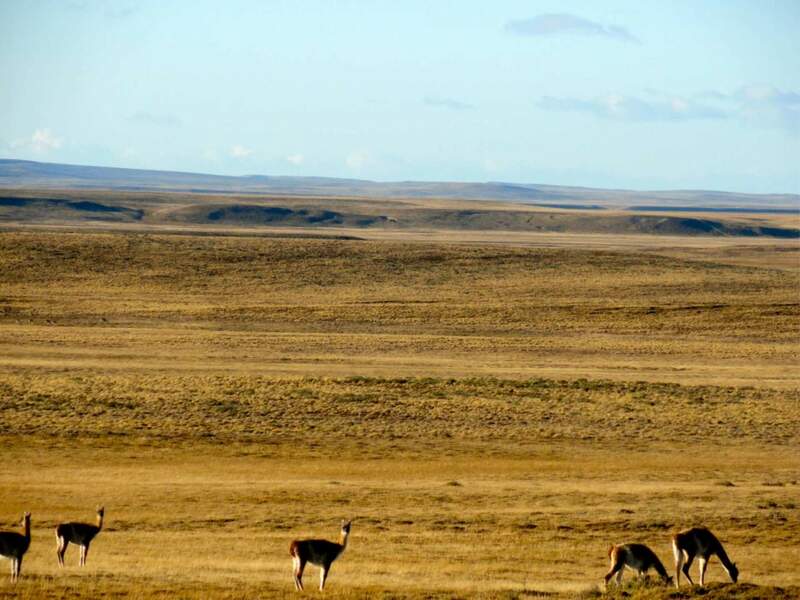 Herds of guanacos, some rabbits and the endangered Huemul, or Andean deer, roam what is often referred to as the Serengeti of the Southern Cone. As the Chacabuco emptied us onto the open steppe near Chile’s border with Argentina, the notorious winds that blow west down from the Andes hit—luckily behind us, or we might not have made it. On the barren plateau that led to the border station, we barely survived a brutal stretch of loose gravel and crosswinds that threatened to blow us (OK, mostly me!) off the road. This is standard for the Paso Roballo, and according to the officials, we were the only people crossing into Argentina that day. They shut down this station in about a month because winter makes the rough road impassable. We had neglected to determine the distance from the border to the nearest town in Argentina, Lago Posadas. Our shoddy map-reading skills became clear, once again, when we discovered that the town was not 20 km from the border but about 70! It had been three days since we left the last poorly stocked store in Puerto Bertrand, Chile, and the food situation was becoming dire. The border officials stared at us in disbelief as we pedaled away into the howling wind. Dry, cracked lake beds, eroded rocks and wind-whipped silence greeted us past the border. Empty and desolate, this place seemed like the end of the Earth, a feeling compounded by what felt like an impossibly distant horizon. We turned down an unmarked road, hoping it would lead to the town on our map. Miraculously, we arrived in Lago Posadas the next morning, ravenous, but relieved to have made it to an actual town. The hours of siesta though were holy and we couldn’t find a single place to get food for another two hours. We passed the time on the side of the road, hoping a truck heading to Bajo Caracoles would give us a lift. No such luck. We gave up as soon as we could eat, and decided to start biking in the morning. Chatwin famously described Bajo Caracoles as “a crossroads of insignificant importance with roads leading in all directions apparently to nowhere.” But after surviving the Paso Roballo, this dusty little gas stop in the middle of Ruta 40’s most remote section felt like an oasis, at least by Patagonia’s standards. Our initial enthusiasm was dampened somewhat when we saw the prices at the only place to buy food, which also doubled as the town’s one and only hotel and bar. The grand feast we had dreamed about for days was unaffordable, so we made do with stale bread and instant soup, and pitched our tent beneath some trees in an abandoned lot on the edge of town. The constant mutations of the Carretera gave way to a continuum of sky and earth. We were nearing the bottom of the continent, a place of flat roads, straight lines, relentless winds, and a horizon that consumes space and time. At the end of the world—even the locals use that phrase—the Andes can actually feel tame in comparison. Here, the few trees that can survive are permanently bent in the direction the wind blows; weather is as mercurial as ever, and the hardest part of our day is trying to get the right combination of layers, as we alternate between sweating and freezing. In the morning, it’s easy. We are cold even before we leave the tent. To accelerate the warming process, we put on every item of clothing we have and begin pedaling as fast as possible, trying to remember what our feet felt like (they had been numb for days). Fall temperatures have finally caught up to us, as we wipe frost off our bike seats and spot cracked ice covering pools of water by the side of the road. (Spring in Canada is autumn in Patagonia.) Daylight is scarcer, too. The sun sets at about 8 p.m. and doesn’t rise until 8 a.m., which means 12 hours of sleep, and the rest of the time spent moving as much as possible—both to get somewhere and to stave off the cold. By the time we reach Tierra del Fuego, a small sign of humanity is more potent than the immensity of wilderness. Nothing but wind and sea and sky. Kindness, though, like everything else here, exists in extremes. The man who emerged from that dilapidated hut that I told you about at the beginning of my story was Victor, a fisherman who lives in this one-room shack year-round, without running water, heat or an indoor toilet. It’s dark and about as primitive as the harsh Patagonian winters permit. But without hesitation, Victor offered us, two complete strangers, everything he had. We stepped inside the six-by-six foot room that houses only a bed, table and wood-burning stove, and which has a clipping of a half-naked woman pinned to the wall (distractions must be hard to come by). Victor motioned us to come with him while he set his nets. We walked along the beach and helped him untangle the lines. Under a darkening sky, he rowed us back along the water, smooth as black glass. His movements were strong and fluid, and it felt weirdly soothing to sit on the bottom of a tiny rowboat, rocked by the sea beneath us. Back inside, Victor brought out a sizzling tray of lamb. We meet his neighbouring companion, a rotund fellow fisherman with wild hair that looks like it hasn’t been washed in months. Victor doesn’t know his name, but I guess he had no need to. The two men sleep, fish and eat side by side, and somehow names are irrelevant. The four of us picked up the pieces of meat with our hands and gnawed them down to the bone. Fat dribbled down our faces. Victor was born into a family of fishermen on the island of Chiloé, off the west coast of Chile in northern Patagonia, far away from here. I asked him why he moved to Tierra del Fuego, to the edge of the world. “Los pez,” he says. For the fish. And why are we here, I wonder? Why pedal 5,000 km to the edge of the planet? My answer is elusive. We dreamed of high mountains and roaring rivers, lost valleys and lakes of liquid glacial ice. But on a bicycle, Patagonia’s wildness was simultaneously poetic and painful, and the ratio between the two rarely made sense: how often did we pedal uphill hour after hour, with a few moments of effortless movement as our reward, only to start climbing again? Yet somehow, with enough repetition, these acts of irrationality seemed less insane the further south we travelled. And as we sat in the dark, cave-like interior of Victor’s shack, on the edge of nowhere, it all suddenly made sense. After dinner, I watch while Victor brushes his teeth under the stars, a ritual he repeats night after night. In the morning he will get up and go fishing, and we will get on our bikes and keep pedaling. For now, it’s all the incentive we need. 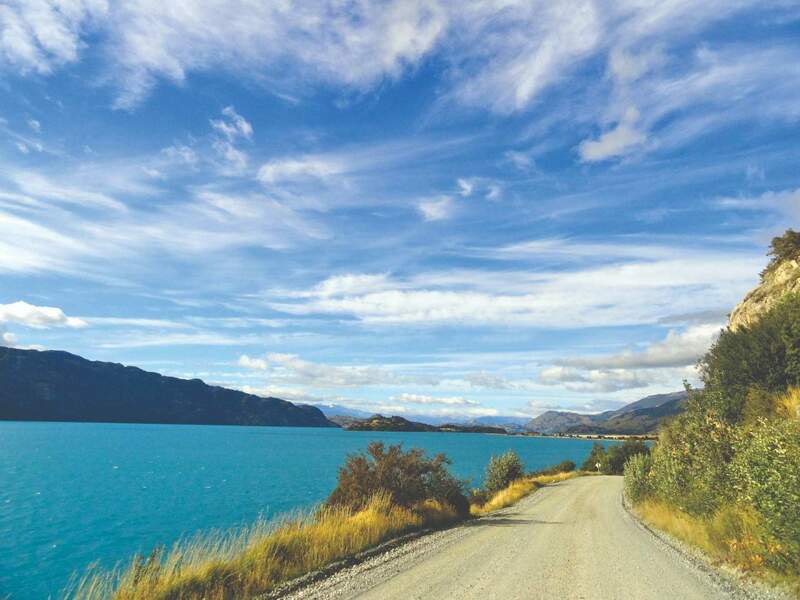 Sarah Tory’s story of her epic Patagonia bike trip first appeared in Outpost magazine. Born in Toronto, she now lives and works in Colorado as a journalist and writer with High Country News, focusing on environment, justice and migration. You can check her out at www.sarah-tory.com or on Twitter (@tory_sarah). 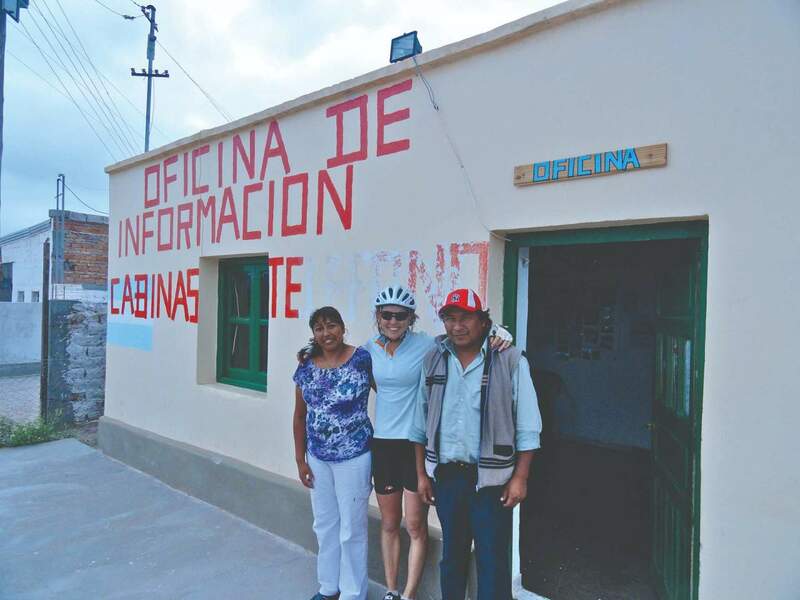 Sarah Tory’s story of her epic Patagonia bike trip first appeared in Outpost magazine. Born in Toronto, she now lives and works in Colorado as a independent journalist and writer, and for High Country News, focusing on the environment, and issues of justice and migration. You can check her out at www.sarah-tory.com or on Twitter (@tory_sarah).